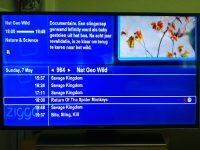 Return of the Spider Monkeys was broadcast on 07 May 2017 in Europe and Africa on the channel Nat Geo Wild. Stay tuned on National Geographic Channel to not miss the broadcast in your country! Ateles Films received a few pictures from viewers across Europe show “RETURN OF THE SPIDER MONKEYS”.